In this post we will show you how to Optimize your project. From Settings tab you must select Bucket size and Sequence from System. Sequence is also very important for optimizing your render time on rend-it.com. The idea of sequence is to put the hardest parts of each frame to render first. For example, if you have a high polygon object on the left side of your frame, it is best option to select sequence “Left->Right”. If you have, for example high polygon object on the top of your frame, it is best to choose “Top->Bottom”. 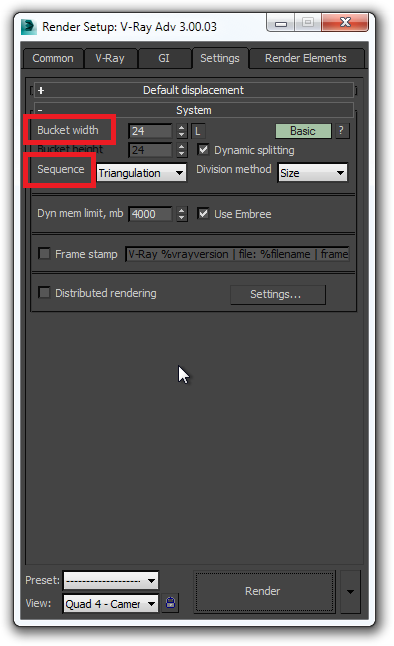 But if you have a high polygon object on the right side of your frame, you won’t see sequence “Right->Left”. You have to expand the “Basic? Tab” and then you will see a thick named “Reverse sequence”. So, if you’ve selected “Left->Right” and you select “Reverse sequence”, your frame will be rendered “Right -> Left”. The high polygon object will be rendered first, which will give you best time for rendering the frame at rend-it.com and can save you great deal of time and money. render-it.com is used by some of the best 3D design and animation teams in the business.